We supply and install replacement and additional sockets to both home and business customers. We can offer a wide range of socket covers, which can match either your existing covers or we can add install new ones and upgrade your old ones to give your room a fresh new look. 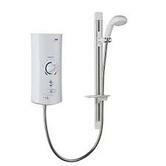 Electric showers are ideal for families and households where there is a limited supply of hot water. Electric showers are always ready to use, any time of the day or night as they heat the water as you use it by passing water over a heating element inside the shower – in a similar way to how a kettle works. We install new showers as well as replace old units. 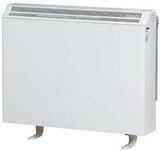 Storage Heaters operate using low cost, off peak electricity tariffs such as Economy 7 or Super Tariff. Because Dimplex Electric Storage Heaters use inexpensive off peak electricity they are cheap to run. With very low installation costs and virtually no maintenance required, the lifetime cost of owning a Dimplex Electric Storage Heating system is considerably lower than heating with other fuels. Storage Heaters give heat 24 hours a day which keeps your home warm and protected from frost or condensation. There is no need for pre-heating because rooms are never left completely cold. For more information on Dimplex Electric Storage Heaters click here. Or call our team on 01904 659066 and we’d be happy to chat through he options. How to install an electric cooker depends on whether you are replacing an old cooker, or if it's a new cooker and needs electrical cabling fitting. For a replacement oven, we will check existing cabling and make sure you have sufficient fault protection in place, either by RCD protection (tripping) or by checking the earth loop is right to achieve automatic disconnection of supply should a fault occur in order to keep you safe. For new cookers, we will install all needed cabling and required safety measures. We install fans and ventilation systems to toilets, bathrooms, kitchens and utility rooms. We have a range of systems from 4” – 16” with the facility to operate via light switch with a timer over run or through a humidity controller. Choose the right equipment to achieve clean, fresh and healthy air. Fans and other air management equipment plays an essential in your home as it reduces condensation which can cause mould and damp. If something goes pop we are happy to investigate what has gone wrong and advise whether to repair or replace the item. If you have had electrical damage similar to the pictures shown below, please don’t hesitate to get in touch. We would be happy to arrange an engineer to carry out the work at a time convenient to you. However small your project may seem, DO NOT be tempted to DIY with electrics unless you are FULLY COMPETENT and know exactly what you are doing. Electrics can be very deadly and quite often you don’t know anything is wrong until it goes bang, which could be fatal or at the very least extremely expensive. We are a family run business and no job is too small for us, so please get in touch and we’d be happy to help and keep you safe.